This teabag wisdom is perfect for me right now. Perhaps for you too? So many women are taught to ‘be kind’ and put others first. ‘To understand before being understood’ is a great concept for people who tend to be self-centered. But those of us who give till it hurts, by putting others’ needs before our own, don’t need this mantra. Co-dependency is a sickness. It’s learned, usually from a very early age, within a family dynamic. But society as a whole (especially in the South) can push women to support, volunteer, and basically put way too many others’ needs first, at the detriment of their own dreams and sometimes their own basic needs. So many women and yoga teachers (lol) are co-dependent or are people-pleasing helpers. It’s great to be compassionate, but it’s not great to be taken advantage of, is it? So the Universe will keep sending the exact experiences we need to learn important lessons to help us grow into stronger more self- compassionate people who stop letting in, or doing bidding for, pushy or selfish takers. Breaking old habits is hard. Finding strength to calmly voice myself, set boundaries, or walk away when I am de-valued—no matter what my timing may be—puts me on the right path to self compassion. Most often, in a situation that arises when a person goes back on their word, in work or in friendship, I don’t speak my mind directly due to a fear of confrontation, or maybe an underlying feeling of not being worthy. It’s irrational. It’s likely linked to how I was raised where direct confrontation wasn’t allowed without some sort of punishment. So I often don’t respond immediately when I should, and a few days or a week later, when I have time to think about it, I re-group and find the courage to address a situation. Often that’s in writing. Maybe because I hate fighting and shut down. And maybe because some manipulative or dramatic people might start crying or complaining or making excuses for their bad behavior and I might not finish saying what needs to be said. Other times, I have this knee-jerk fear of being yelled at or hit, which is also irrational. (I’m working on it.) And the Universe keeps sending me situations and people where my ‘kindness is taken for weakness’ like the Rihanna song. But I’m determined to work on my throat chakra and speak more clearly and directly the moment things go awry, as it shows that I value my time and myself and even the person causing me anxiety if I speak boldly and give them a chance to respond. So, the moment a client says he will not pay me for services rendered and agreed upon and accepted, for instance, I need to speak up and invoice again. The minute an agreement isn’t honored, or a contract not adhered to, I need to speak up clearly and calmly. When someone doesn’t follow through with a promise or lies to me, in friendship, I need to speak up. And if that isn’t received kindly or respectfully, I need to walk away. It’s as simple as that. Think about it. The man whose mother was overly critical will likely feel at home with, and date, a critical, bossy woman. It’s the same as the gal who might have been verbally abused, or witnessed abuse in the home. She might become attracted to a difficult man who is hot and cold and not always kind. She may become focussed on changing him, understanding him, or earning his love—reflecting unmet childhood needs. But once people ‘get it,’ they really get it. Maybe the Universe gives us experiences so we can feel those unmet childhood needs and then release them by ‘getting it.’ Once I ‘get’ that someone’s proclaimed love isn’t healthy if their love is neglectful, controlling, confusing, dishonest, shut off, or whatever the case may be, I allow myself to ‘get’ what true kindness is—what ultimately I believe we are all attracted to on a deep soul level. True kindness is priceless. It gives space to those in your life to be themselves. It gives space to yourself to explore your dreams, speak your mind, be seen and heard and accepted, exactly as you are. True kindness is about strong action, not words. A person that shows up for you, is there for you, who listens without trying to fix, or control or manipulate, is a gift from the Universe. When we value ourselves, we value the uniqueness of others more, honor agreements, are more respectful, and are more accepting and open. Kindness starts inside. And I’m realizing that it may not look like what was shown to me in my youth. It’s not about volunteering all the time at my child’s school or outside appearances. It’s about modeling self-worth, self-discipline, mindfulness and closeness at home. It may mean I have to say no, and remit invoices and stop someone mid-sentence when they go back on an agreement in the future. (And hopefully, less of those experiences will be drawn my way.) It may also mean walking away, yet again, from someone I love whose love isn’t loving or kind. Because if I’m loving and kind to myself, I won’t accept being with someone whose behavior is neglectful or hyper critical or controlling—all making me feel bad about myself. Staying with someone who hurts me, is just a form of procrastination, as it thwarts me from stepping into my dreams and into the highest version of myself. What I’ve come to believe is that any thing, situation, or person, who constricts another’s heart, is there to teach a hard lesson. When a person keeps returning to those things or situations or people, it’s soul-crushing. The action of returning to abusive situations or people says more than words ever could. It says I’m not worthy of better and I’m going to waste time with this pain and not be able to reach my dreams or live a peaceful life, being authentically me. It is self-sabotaging—even when the intention is one of ‘rescuing’ or ‘helping’ a loved one. Especially then. Even if it’s rooted in fear of the unknown, because that isn’t trusting the Universe to provide or feeling worthy of receiving healthy loving situations and people in our lives. We are all deserving of love, joy, friendship, support and respect, just for being alive. I’m grateful for the lessons that I’m learning. I’m grateful even for feeling and seeing the pain of staying in bad situations and comparing that to the pain of setting boundaries and walking away from them. I can try to work with someone and cringe when I set boundaries and ask for them to honor agreements, or my time, but in the end, it’s what is necessary for me to respect myself and my family. And it’s the same with love. I can love someone dearly and still walk away. I can see their goodness and potential, but realize that they will continue to hurt me because of where they are in life. Walking away is actually harder to do when you still care, but in the end, no one can ‘fix’ another. We can only love each other and love ourselves. Walking away from who hurts (or bad boys, as my friend likes to judge) allows me to make space for someone and for situations that feel good, uplift, is respectful and where I’m valued. I’m grateful for all of my mistakes and blunders as I try to find my way to a stronger, authentic, self-compassionate space. And thank GOD for the women in my life who are showing me what strong kindness is. You know who you are! Why is it harder to set boundaries with some people than it is with others? Have you experienced this? For me, it’s usually with a particular friend or boyfriend who I am rooting for as they struggle with hardships. I can see their potential. I can see their goodness. I can see that times are just really hard for them, so, if asked for help, I usually say yes. Can you relate? But the longer I help someone in need and see the extent to their crisis or struggle, the less likely I am to speak up about my needs. When I swallow what I need and am always available to help someone, that person loses respect for me, ironically while they may be asking for even more of me. And if this goes on for any length of time, say a person doesn’t get better or can’t support themselves, or becomes aggressive, needier, or abusive, I’ve teetered into really unhealthy territory. I’ve crossed over into co-dependency, when I should have set a boundary. (Sadly, I’ve had therapy for co-dependency and read many books on the topics too. Melody Beattie’s Codependent No More is amazing btw!) Clearly, I still have a lot to learn. With certain people I can start to feel nervous or guilty just trying to say what I need to say, or do what I need to do. That’s because a pattern got set of me always being there for them and now that I’m aware of it, it upsets the dynamic of the relationship, even if it’s an unhealthy one. These people trigger my upbringing because I can anticipate getting yelled at, guilted or manipulated or abandoned, or all of the above, as punishment for voicing my feelings. So fear of being yelled at or abandoned is real for me. Even though I wanted to avoid these two things in my relationships, for most of my life, I attracted them. (But that’s another post, maybe!) I remember vividly being yelled at by an ex-boyfriend because I dared to stop during a road trip to go to a Target to buy tampons. It was a busy Target, I admit. The lines were insane, plus I had to find a bathroom and then get a drink in order to take a few Motrin. With traffic being bad, I was likely 45 minutes off schedule for arrival. The inconvenience of me not arriving at our weekend destination on time in order to help him unload his car and help settle a family member, out-surpassed my cramping and desperate need to ensure I wouldn’t soil my clothes. I was yelled at in front of others when I arrived. I should have turned around and drove home that evening. Lets just say it was an eye-opening New Years Eve for me. I set New Year’s Eve intentions to follow my dreams without guilt or fear of abandonment. Who knew that one incident set me on a course to write my book and begin yoga teacher training? The Universe gives me the lessons I need, if I pay attention, and if I’m willing to open my heart, to change. I didn’t yell back at my ex-boyfriend. I just asked to go my room and I journaled, meditated and set my mind to stop neglecting my needs. But sometimes I cha-cha in life. I take two steps forward, think I’ve got the dance down, and land one thudding step back. It’s okay. I’m learning to set boundaries, even if I don’t say what’s on my mind always in the moment. Sometimes I opt for peace, especially if another person might not be open to hearing what I have to say without getting angry. I can set a boundary without saying a word. I can just distance myself, not always be available, not answer every text. (Folks in LA have that one down!) But it doesn’t feel respectful with someone I really care about. That’s when I often stumble. When I care, I can ask for space or a boundary by making excuses or justifications or apologies…In the end, it’s not necessary. As a good friend told me, it’s just a matter of me connecting to my heart that is saying I must check in and take care of me, my needs, my family. If a friend can’t respect that, or is angry, or confused about it and wanting to engage in a lot of dramatic banter, I shouldn’t justify myself or try to explain, or make it into a painful dialogue, no matter how much I love them. I shouldn’t have to. The lesson for me,is to speak my truth earlier, in the moment, regardless of how the other person responds. As long as I am kind and coming from a heart-felt place, it will all work out exactly as it is meant to. First: in order to bloom or re-bloom, we have to know ourselves. So many of us really know what others want. If you are a good friend of mine, or another mom, you’re likely nodding. We know what our partners want and we try SUPER hard to give them what they want or BE what they want. Sigh…We know what our children need or want and we do double flips to provide that too. But stop. What do you need to thrive? Do you even know what makes you feel good? Do you know what type of bloom you want to have? Purple? Yellow? White? What do you like besides taking care of others and trying to BE what others want? Are you on your to-d0 list? What conditions have to be met in order to thrive? (An orchid needs a little sunshine, but diffused is best, and some heat and humidity and a little splashing on the leaves from time to time.) What do you need? And I’m NOT talking about what another person can do for you. What do YOU need? What makes YOU happy? Daily walks in nature? Meditating? Singing at the top of your lungs in the car or shower? Driving for a long distance with a vista to FEEL free? Deep breathing to kickstart your happy hormones from your gut? (See This article for more info!) Cooking classes? Yoga? Jamming on the piano or guitar? Writing? Biking? More water? Less coffee? Less sugar? What makes you FEEL good so you can DO good? What helps YOU become, well, more YOU. You see, when you try to BE someone else or please others all the time, you lose a little of yourself. Year after year of this, you may not even know who you are. See, what my orchids tell me is that it’s imperative to create the conditions to thrive—so figuring out what those conditions are is critical and NOT selfish. If you make your life ALL about other people and what others want, well, you may end up being an orchid in a dark room, dry and without the ability to bloom. What can you change up to inspire some growth? Maybe it’s something as simple as getting a new vista. Walking in a different direction. Taking the stairs at work. Driving a different route. Saying yes to a new experience or a new friend. Setting a boundary when something or some one doesn’t feel right. Maybe you need to speak your truth and walk away from something or someone that hurts. Sometimes I have to experiment to find out what works for me, what feels right to me and where I can thrive. This I know for sure: When I focus on doing what ‘seems good’ to others, or when I ‘think’ myself into a relationship instead of ‘feeling’ my way, I don’t honor myself because I don’t know myself and I put others first, yet again. I can’t thrive in those situations. I land in a place where I just don’t feel rooted, or where I can establish roots and grow. These are just some lessons from the beautiful flowers in my home. There is a deep richness and infinite knowledge in them that I’m reminded of everyday. Have a beautiful week! Take a few moments to embrace your infinite light. Embrace your potential! Make a short list of five to 10 things you need to thrive and foster the growth of your awesome self. There’s no one like you. And that’s amazing. Why Can’t I Embrace Time Off? 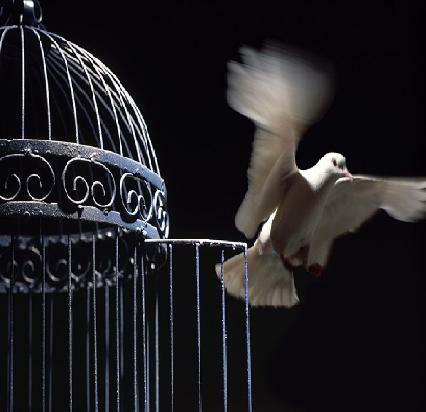 In my own way, I really do know why the caged bird sings. And I know why the bird stays too—even when the cage door is open. It seems selfish to take more than a quick flight around the room. No, the bird comes back to where she’s comfortable and finds beauty in her surroundings and in how happy her singing makes those in the house. Even when those in the house barely notice her and come and go as they please—she knows her role and knows that, somehow, the beauty of her singing and her reliable presence is helpful to those she loves. I read that in Vietnam (and probably elsewhere) Buddhist worshippers release caged birds to improve their karma. In theory, this sounds wonderful. But I doubt that it’s a wonderful feeling for the birds. A picture I saw of a Buddhist releasing three birds spoke louder than words. Instead of flying away, the three birds crashed into one another with their wings barely opening widely enough for flight. It’s not easy to just take flight away from all that you have known, is it? Now that my cage door has been blown apart, I see how ridiculous living for others all the time truly is. It’s okay (and healthy) to do things for yourself. It’s okay to take flight once in a while just because it makes you happy. Taking flight is scary for some of us. Doing things for ourselves can seem selfish. Especially if we are the person who fixes things, who kisses booboos, who makes sandwiches, checks homework, listens to woes and gives advice, and who lives daily for the crazy schedules of playdates and homework and dinners, and sports events and mommy-and-me classes. That’s the good stuff, right? It seems to give most of us (I’m talking the co-dependent us) more pleasure than our work—if we work outside the house. And it’s tougher than most work too—at least the two- and three-year-old tantrums are. When you’re the person who supports others, it’s hard to support yourself. (You know who you are: you’re the one who remembers birthdays, writes thank you notes, sends presents, plans parties, playdates, activities, camps, Dr. visits—all between other work duties you master. You’re the one who feels guilty taking time for yourself to exercise or get a rare manicure—as your goal is to make others happy and pleased and not to think about yourself, right?) So where do you exist when all of that is cut off? Where are you when that fades to black? Sound familiar? I wrestled with all of that after my husband left at the end of 2009. But since he lives in Europe and I care for the boys pretty much 24/7, they kept me insanely busy and not able to focus too much on this question. Back then, I was just making it day by day and trying for force myself to eat and keep going. That’s how it was in the beginning with a baby and an 7-year-old to take care of. Flash forward two years and you’d think that I’d have overcome this crazy guilt I have about taking time for myself. To be fair, I have really been taking strides that started with baby steps and I’m getting there. At first, I felt insanely guilty about putting the baby in daycare so I could write (I’m a freelance writer) and get a break. After a year of separation, with me weighing in at 90 lbs and getting little to no sleep due to my insanely sleepless toddler, a good friend urged me to put my little guy in a small, family-run daycare so I could pursue my work and get a break. I did and within a few months landed some great freelance writing gigs. I was able to grocery shop without drama. I wan’t driving for an hour to let the baby sleep since he doesn’t nap at home. I was able to take a run and eventually joined a gym. Taking a pilates or a yoga class felt crazily selfish—even though I went months without a day off to sleep in. Why I felt this way is such a long story including a family history of co-dependency and an upbringing in the South where ladies who do-it-all and support their man are still highly admired. But all of this is part of why the rare, cherished time-off from the kiddos, can be extra-ordinarily and oddly, hard for me to adjust to. The summer holiday for my kids with their dad should be a time for joyous celebration, right? I should be thinking: Hurray! I’m finally going to have some time to myself! And I am excited about that. I’m so looking forward to being me, traveling, writing and reading and just being a woman and not always a mommy. But a large part of myself is also wondering if my kids will put on sunblock or whether they’ll remember to say their prayers/gratitude lists at night or whether they’ll have fights that I can’t help them with, or if a tantrum might push someone over the edge, etc. Seriously, it’s so sad. Even as I write this, I wonder about my sanity. I am the quintessential co-dependant woman. There, I said it. So now, I guess I’ve become the co-dependant single mom who is having a hard time adjusting to the fact that she’s going to be away from her boys for a full MONTH. I haven’t had a week off since last Christmas and I think the last two days off was three months ago. So, yeah, I guess I’m due. Why, then, am I not jumping up and down with glee!? It’s scary to take flight. It’s frightening to venture out and try to reclaim life outside of motherhood. I’m grateful for the chance, but hesitate at the door. Any advice out there, my soul-sister, single moms? Seriously, any words of wisdom will be greatly appreciated this week as I say goodbye to my little guys.